Hi y’all I’m Ryanne! I hope you can guess by now that I’m a mom, yes it’s to the two cuties in the pic below and we live in the Dallas/ Fort Worth area. I am not a native Texan but I like to say that I got here as fast as I could and attended Texas Tech University. About a year after college I started my first “real” job where I ended up staying for 15 years as a corporate recruiter. I know that HR will tell you don’t date people that you work with but I apparently am not a good listener and met my wonderful husband at work (let me tell you how fun it was to go over the fraternization policy with a new employee right after they have figured out they will be working for your husband). We have two kids who are polar opposites but compliment each other perfectly (kind of like my husband and I do). My daughter is in the first grade and is extremely compassionate and loves all things girly- Matilda Jane, American Girl Dolls, baking and Gymastics. My son who is in preschool loves people, dinosaurs, superheros and animals. While one is reserved, the other takes an hour to eat dinner because he won’t stop talking. They are so much of my life, but not all of my life, you see I have always thought of myself as a business woman first. Yet in early 2018 everything changed. I was going for my annual eye exam when it was discovered that I had a tumor that was pressing on my optic nerve and essentially blinding me. I had major surgery to remove a tumor but during my recovery time my husband was promoted to an executive and I was no longer able to work for our company. I was a little lost on who I was and how I could continue to feel like I was “helping” others like I did in recruiting. Since my husband and I both had demanding careers when we started our family I had to get smarter, faster and savvier to get everything done so I figured I could help other women that are going through the same thing so I started The Recruiter Mom. I have always been passionate about shopping and retail- I would tell my co-workers “I’m good at my job but I’m GREAT at shopping”. I get most excited when talking all things fashion, kid toys, good deals, home organization, shoes, mama hacks and everything in-between. My goal here is to make your journey down this road of life a bit lighter and easier to navigate with a friend by your side. The Recruiter Mom uses affiliate links within this site. Purchasing an item through a link from TheRecruiterMom.com or The Recruiter Mom social media (Facebook, Pinterest and Instagram) may result in a commission. Merely clicking on a link does not result in a commission, but if an item is purchased as a result of the link, a commission is earned. Occasionally blog posts have products that have been gifted, if that is the case it will be disclosed within the post. I do not feature all products that have been given to me, only the ones that I truly love! 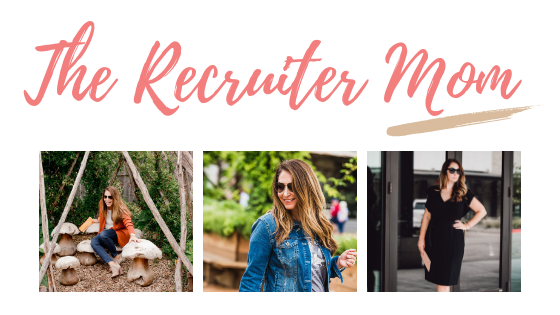 If you have any specific questions about my disclosures or affiliate links, please feel free to contact me directly at therecruitermom@gmail.com. In addition, if you see any images of yours on my site that are not properly credited, please e-mail me directly and I will either remove them or credit them per your request.